Why is the Crimean port still the base of Russia’s Black Sea Fleet, 23 years after the break-up of the Soviet Union? And what is its historical and military significance to Russia? The port city on the Black Sea was founded by Russian Empress Catherine the Great on the southwest coast of the Crimean Peninsula in 1783, on the site of an ancient Greek town called Chersoneus, whose ruins are still being explored by archaeologists. It was Catherine the Great who chose the name for the new city, which is translated from Greek as “highly esteemed,” “holy or majestic city,” and “city of glory”. The main thing that attracted the empress and her military commanders to Crimea were its 30 deep-water harbours. Protected from the wind, some of them cut five miles deep into the rocky coastline. Thus Sevastopol became Russia’s main naval base on the Black Sea, a role it was to play for many years. During the Crimean war, the Seige of Sevastopol (September 1854-September 1855) was the defining moment of the conflict. It took French, British and Ottoman forces a year to capture the city. However, the city endured its toughest ordeal during World War II. In 1941-42, Red Army soldiers and Black Sea Fleet sailors defended it from Nazi troops for 250 days and nights. In the end, they were forced to surrender the city, but even under German occupation, there was a strong resistance movement in Sevastopol. From 1948 onwards, Sevastopol enjoyed the status of a special city within the Russian Soviet Federal Socialist Republic, part of the Soviet Union. In 1954, then-Soviet leader Nikita Khrushchev handed over Sevastopol, together with the rest of Crimea, to the Ukrainian Soviet Socialist Republic – another part of the Soviet Union. The change had little significant effect upon Sevastopol, which, as one of the Soviet Union’s key military bases, continued to be run by the Soviet Defence Ministry in Moscow. However, the situation changed dramatically in the early 1990s, when Ukraine became an independent state and Sevastopol, along with the rest of Crimea, became Ukrainian. Under the Treaty on Friendship, Cooperation and Partnership signed by Moscow and Kiev in 1997, Russia recognized Sevastopol’s Ukrainian status and the inviolability of Ukraine’s borders, while Ukraine granted Russia the right to retain the Sevastopol naval base and to keep its Black Sea Fleet in Crimea until 2017. So what does the Russian Black Sea Fleet consist of? Besides the fleet headquarters and command in Sevastopol, there are: the 68th Coastal Defence Brigade; Navy Arsenal No 17; the 810th Naval Infantry Brigade; the 247th Independent Submarine Division; the 854th Coastal Missile Regiment; a separate marine engineering battalion, a communications hub; the 30th Surface Ship Division, consisting of the guided missile cruiser Moskva, guided missile hovercrafts Bora and Samum, a brigade of auxiliary ships, a brigade of assault landing ships, a brigade of missile boats; a naval air assault squadron, a composite air regiment; a radio electronic support brigade; arsenals, depots, repair plants and training schools for junior officers. A total of 25,000 servicemen, not including civilian staff, are employed at the fleet’s facilities. When the families of these servicemen are taken into account, this figure grows to more than 100,000 people. Under the May 31, 1997 agreement between Russia and Ukraine on the status and terms of the Russian Black Sea Fleet’s presence on the territory of Ukraine, at any one time there can be 388 Russian vessels (including 14 diesel submarines) in Ukrainian territorial waters and on land and 161 aircraft on leased airfields at Gvardeiskoye (north of regional capital Simferopol) and Sevastopol. These figures are comparable with the size of Turkey’s naval force, though in fact the number of Russian vessels and aircraft in Crimea does not approach this figure. The original agreement was signed for a period of 20 years. It was envisaged that it would be automatically extended for subsequent five-year periods unless one of the sides, in writing and a year in advance, notified the other of a decision to terminate the agreement. A second agreement, signed in Kharkiv in 2010, extended the duration of the Russian Black Sea Fleet’s presence in Sevastopol till 2042. 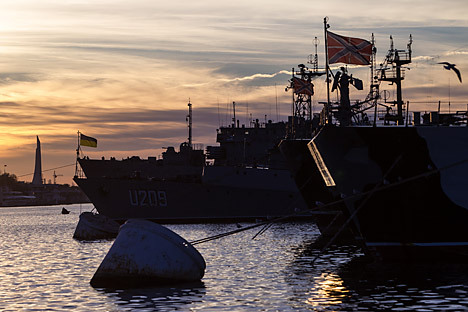 Russia pays Ukraine $98 million a year for leasing the naval base in Crimea. Furthermore, under the Kharkiv agreement, Russia grants Ukraine a discount on gas. Russia is forced to bear these costs because it has failed to build an alternative base for the Black Sea Fleet on its own territory. Russia’s own Black Sea port at Novorossiysk is not deep enough and lacks the necessary infrastructure. Regardless, the fleet has an important strategic task that it must continue to fulfil – protecting the south of Russia and preventing a potential enemy's aircraft carriers from entering the Black Sea.